However, we do not wish to lose the fact that plugins exist to help aid you in the creation of music. Therefore, we are happy to announce the immediate release of RP-Reverse! 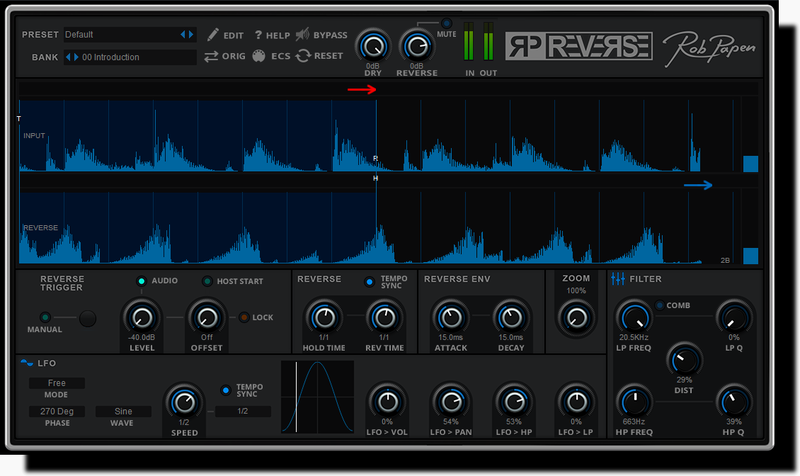 RP-Reverse is an FX plugin for the creatively minded artist that loves to add different sonic ingredients into their tracks! RP-Reverse is also part of the eXplorer-5 bundle! So if you already own eXplorer-5 please log into robpapen.com and download the latest eXplorer-5 installer and run it to add this new creative FX to your plugin list. This amazing bundle now contains up to 22 plug-ins and additionally you can also request Prisma, which is a fantastic plugin to combine and layer your Rob Papen instruments.